I used to read a lot of blogs (and a lot of magazines), but as the blogs have become more commercial and less authentic (and the magazines have become thinner and flimsier), I stopped. Now, I only check two blogs daily and after that, I like to get off my computer and get my daily inspiration of fashion / food / entertainment by talking to people and being on the New York streets — there is a lot out there by just looking around. Last week, I randomly visited a-previously-loved-blog (but now never frequented), Man Repeller. And I found a post that brought me to tears. It was real, emotional, sensitive and raw. Leandra Medine, the founder of Man Repeller, had been very vocal about her struggle with infertility over the past years. And as someone who struggled to get pregnant (I did 5 rounds of IVF), I felt for her. (More from me on the topic here). Those years of trying to get pregnant were some of my (and our) hardest, and I always empathize with anyone going through those emotional, mental, and physical struggles — so incredibly painful. Although I do not know Leandra personally (we have worked out next to each other several times in a workout class), there was always something so honest and true in her posts about her struggle. She announced that she is now pregnant with twin girls in a beautiful, authentic and real post. She expresses her gratitude and appreciation and love of being pregnant, while understanding and giving hope to everyone who is struggling/has struggled with infertility. I value her words, articulation, position, and message. So please, read her post HERE. And thank you, Leandra, for being sensitive, emotional, empathetic, and real. I wish you all the best in your pregnancy. 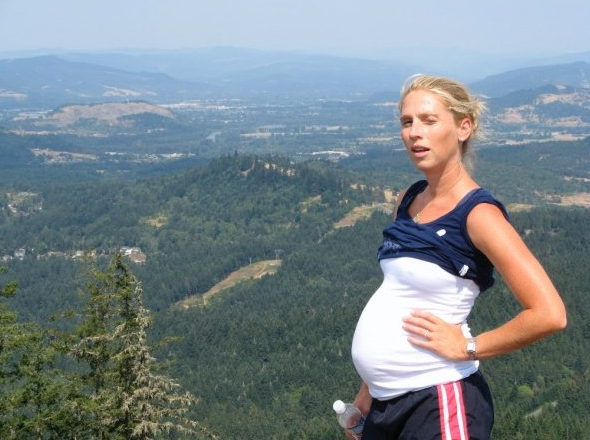 Circa 2009 hiking Spencer’s Butte in Oregon. Such a baby expecting a baby. Thank you for reading and understanding that everyone is going through their own sh$t. We all need to treat each other with love and kindness. Have a great week! I carefully read her post and I liked her way of storytelling. It’s definitely empathetic and real. I feel her struggle so deeply. I wish her all the best with her pregnancy! Love this! Great read and thank you for sharing (both of you).